NEW YORK - Greetings from New York! I'm here for the fourth biennial Starling-DeLay Symposium on Violin Studies at Juilliard, which begins on Tuesday. Basically, some wonderful teachers and pedagogues will be teaching master classes to a group of young artists, and giving lectures and pedagogy classes to a larger group of violin teachers like myself. And of course I'll write about it all this week! Check it out: Legendary violinist Itzhak Perlman, Juilliard Dean Stephen Clapp, CIM professor Paul Kantor, NEC professor Donald Weilerstein and Violinmasterclass.com guy Kurt Sassmannshaus EACH are giving master classes. Indianapolis International Violin Competition winner Augustin Hadelich will play a recital, as will a number of other fine young artists. And Simon Fischer, most famous for his books, Basics and "Practice," will speak on "The Basics of Intonation," while Indiana University violin professor Mimi Zweig will lecture on "Kreutzer Etudes and the Development of the Young Artist." Also lecturing are Robert Duke and Brian Lewis, both of the University of Texas at Austin. Everyone included, the gathering brings together people from 38 states and 15 countries. P.S. Brian, my six-year-old, took my new profile photo. 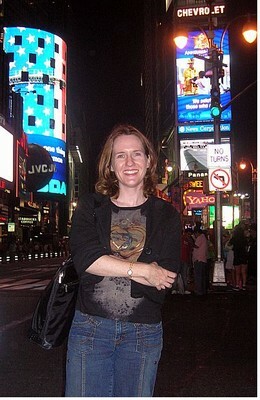 And the Times Square photo! I am so jealous why cant they do these seminars when people dont have a tight teaching shedule like in July or August.Keep us informed Laurie. Welcome to my town, Laurie! Great picture! Good job, Brian! Wow - the mother lode of violin teaching! I hear your excitement way down here in Georgia and look forward to your posts. This is really exciting...have a wonderful time! Sounds like a great series at the symposium. Enjoy the visit to NYC!